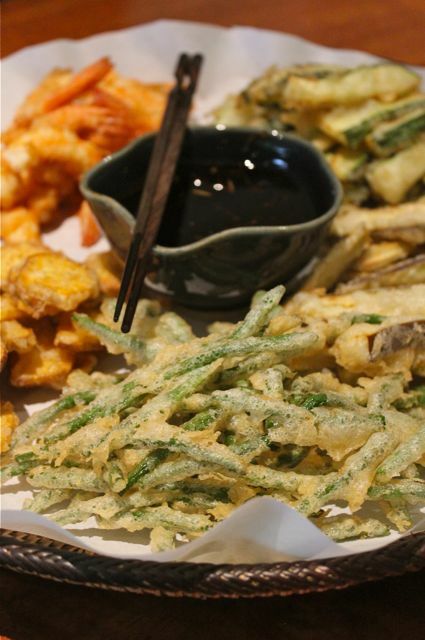 For the tempura platter above, we prepared some very thin french green beans, eggplant, zucchini, kamote or sweet potatoes and shrimp. When everything was prepped, including the dipping sauce, grated radish and ginger, we sent the warning bell out to the family to be ready to sit down to lunch in about 15 minutes… To make the batter, I added one heaping cup full of all-purpose flour to a bowl (best if the flour is very cold, or has been stored in the freezer for an hour or more), and one 12 oz can of club soda that was put into the freezer 30-45 minutes before so it was almost icy. Use a whisk to bring this together and leave it a tad lumpy. Add two or three generous pinches of kosher or other fine sea salt while mixing. Using a wok, heat up roughly 3-4 inches depth worth of vegetable oil and bring it to about 360-370F, using a deep fry thermometer. Put a handfull of veggies in the batter, and carefully drop them gently into the hot oil and cooke for just a minute or two until crisp and lightly golden in some parts. Take out using a spider and plae on paper towels or a large paper napkin. Serve immediately. These beans and other vegetables were terrific. The batter really light and crisp, you can almost see and feel the bubbles in the batter “set” as it fried. 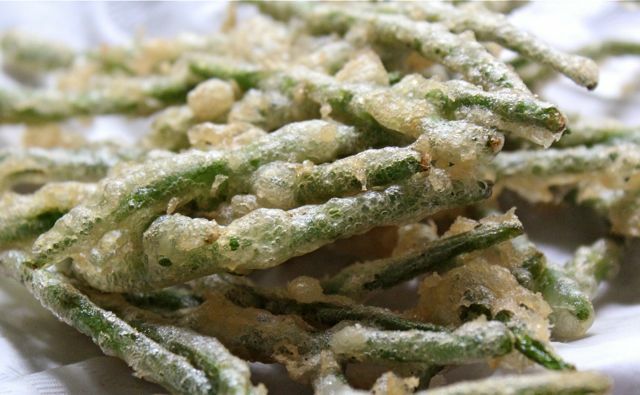 They remain crisp for several minutes, but ideally, you should be frying small batches of vegetables or shrimp and consuming these soon after they emerge from the fryer. Delicious! 4. Drain on paper towels and arrange on a platter and serve immediately. We served this with some cold soba noodles on the side. The crisp batter and moist vegetables went really nicely with the cold soba noodles. Heston Blumenthal is one celebrity chef I never tire of watching although there is just no sane chance of me replicating his search for perfection at home. Just as you suggested, he used beer for his fish and chips batter, mixed it with the flour just until blended and still lumpy. Loaded it into a CO2 soda siphon and refrigerated it before spritzing it out to coat his filleted turbot. Tried it skipping the soda siphon bit for gambas rebosadas which turned out perfectly ethereal. I love Heston Blumenthal’s books, shows and ideas… fantastic. The advantage of rice flour, apart from the crisp results, is that it browns slower if at all. Hence, frying can be done for longer to ensure the food is cooked through. Plus, it sort of repels the oil. Gluten elicits such cognitive dissonance. With adequate aeration/leavening, hydration and development, it provides the structure needed for a brittle but lasting and crispy shell. On the other hand, without the precise treatment, it can be heavy, chewy and oil absorbent. A trick to getting around this and have the best of both worlds is to use baking ammonia( ammonium carbonate ). What this does is it weakens the gluten in an incomparable way resulting in an extremely porous structure leavened by the CO2 produced. Think corals! The porosity means quick drying and therefore thorough crisping. Gluten being gluten, it still maintains structure and hardness but in this case rendered very brittle. Frying needs to be quick to prevent oil absorption. The addition of egg yolk gives quicker colouring while some rice flour contributes added crispness. Be warned though, you only need very little ammonia and it needs to be thoroughly incorporated. This brings back so many memories since this is one of the meals that my foster family cooked for me when I was an exchange student in Japan for a week. They had a mini deep fryer and the tempura shrimp/veggies were cooked right beside the dining table and served straight to our plates. Yes, beer is a good option. 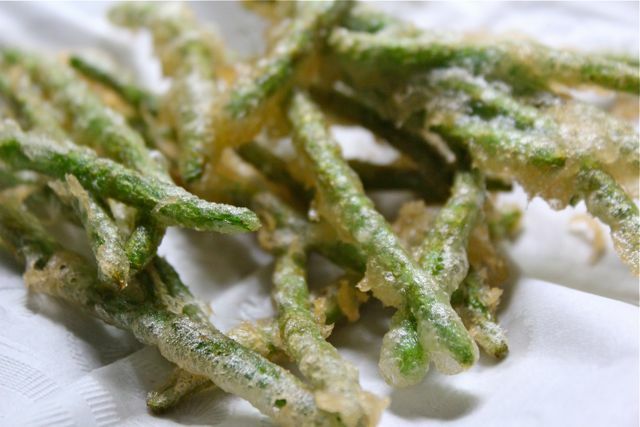 We once had a professional chef from a Japanese restaurant serve at a party at home and this is what he used to create ”restaurant-quality” tempura. MM ,beside all the vegies you mentioned above, I love mushrooms,sage leaves and onions in my tempura,too. I have a subscription to Saveur—recipes are few but fantastic, articles all properly researched and well-written, it’s an intelligent and drool-worthy food mag. :) Wish there were more like it. It seems to me that it is not the deep frying itself that was introduced by the Portuguese but the idea of skipping meat for Lent (ad tempora quadragesimae, quaresma in Spanish), hence the shrimps and vegetables. Presumably, they were introduced to christian converts. But even this is kind of specious because the japanese, being previously mostly buddhists, were not gung ho about eating meat either. In fact they were so opposed to eating red meat that they did its cooking outside on heated plow moldboards which was supposed to have originated their teppan to serve to mostly foreigners. Oh, thanks for the post! I always tend to avoid the tempura just because of the reasons you mention; Too thick batter, too greasy and so forth, and I never want to chance it. But I’ll take your advice and try what you said; Rice flour and definitely mixed oil for frying. The other tips I already follow, especially the drying on paper towels, works really well with bacon as well, if you want crispy bacon to cut over a salad or so.